A written copy of your spectacle prescription. Digital copies are available upon request. Why is an eye exam important for adults? A regular eye exam is recommended for all adults, but especially for adults over the age of 40 in order to preserve their vision and guard against eye diseases. Over the age of 40, you may begin to experience changes in your vision and need to wear prescription eye wear. If you already wear glasses or contacts, you may find that your prescription needs to be adjusted to ensure best vision and comfort. Most importantly, as we mature, our eyes are susceptible to a number of age-related conditions that can severely impair or even destroy our sight. Although you may experience no symptoms, the conditions that begin to affect your eyes in mature adulthood include presbyopia, glaucoma, cataracts and macular degeneration. Some medications can also have a detrimental effect on your eye health. Your optometrist knows how to identify the early onset of these problems, assess your ongoing risk factors and help you keep your eyes healthy and strong so that you can continue to get the most out of life at work and at play. Many important eye diseases as well as systemic diseases manifest themselves in the retina. The most prevalent causes of blindness in the industrialized world include age-related macular degeneration, diabetic retinopathy, and glaucoma. With a retinal exam and the use of a retinal camera image, we can identify and offer treatment or refer you to a specialist for treatment of these diseases. 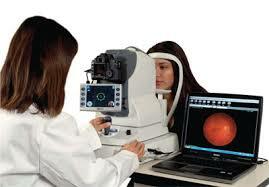 We now offer visual field testing at our location. A visual field test is designed to identify changes in your central and peripheral vision. 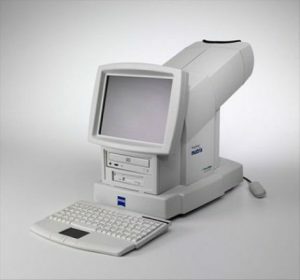 Each eye is tested separately and the test takes 3-6 minutes per eye. If the Doctor prescribes this test you will be asked to react to stimulus on a screen while you are focused on a central dot. Diabetes can affect the retina in the form of diabetic retinopathy, a condition in which blood vessels in the eye bleed and damage the retina. There may be no symptoms early in the disease, however, later symptoms include blurry vision, seeing spots or floaters, and sometimes even blindness. Macular degeneration is a condition in which damage occurs to the macula, the part of the retina responsible for sharp central vision. It is possible to detect early signs of macular degeneration before symptoms occur. Risk factors include aging, smoking, lighter skin and eye color, obesity, and heredity. child’s eyes tested at an early age. One preschooler out of six has a vision problem severe enough to affect their learning ability. By grade six, one in four students have a vision problem severe enough to affect their learning ability. On average, 60% of children identified as having learning disabilities also have uncorrected vision disorders. Only 14% of children under six receive professional eye-care and 50% of children will not see an optometrist by the time that they graduate from high school. 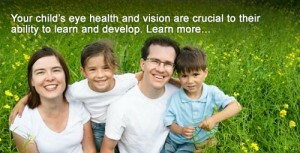 Healthy eyes and good vision are critically important components of any child’s ability to learn. In fact, some say 80 percent of learning is visually based. Some signs that might indicate your child is having vision problems include complaints of headaches, tendency to rub his or her eyes, holding reading material very close or avoiding close work. An eye exam is necessary to rule out amblyopia (lazy eye), strabismus, muscle imbalances, high or unequal refractive errors, and other eye diseases. Early detection of eye problems such as lazy eye and strabismus is crucial because children are more responsive to treatments when treated early. We recommend that every baby receive an eye exam between 6-12 months of age, as well as annually during the school years. 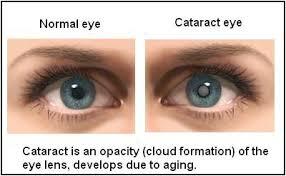 A cataract is a cloudy or opaque area in the normally clear lens of the eye. Depending upon its size and location, it can interfere with normal vision. Most cataracts develop in people over age 55, but they occasionally occur in infants and young children. Usually cataracts develop in both eyes, but one eye may have somewhat worse vision than the other. Early symptoms of cataracts include blurred vision, glare and difficulty reading. Cataracts generally progress very slowly, and surgery may not be needed for many years, if at all. In some cases, periodically changing your eyeglass or contact lens prescription may continue to provide you with good vision. There is no way to prevent cataract development. Currently, the only way to treat cataracts is to surgically remove the natural lens in the eye. A new clear lens is implanted. You will be referred to an ophthalmologist who will do your cataract surgery and after six weeks you should return to your optometrist. Your optometrist can evaluate if you need eyeglasses or contact lenses for optimum vision. Most people need to wear glasses after cataract surgery, at least for some activities. Following cataract surgery, you will still need regular eye and vision exams to monitor your eye health and vision. If you had cataract surgery on only one eye, your optometrist can continue to monitor the other eye and help you arrange for surgery on the second eye, when needed.What is a secondary cataract? You may have heard about a condition called “secondary cataract” or “after-cataract.” This occurs when the lens capsule, the membrane that wasn’t removed during surgery and supports the lens implant, becomes cloudy and impairs your vision. Another term for this condition is posterior capsular opacification (PCO).A secondary cataract can develop months or years after cataract surgery. You may feel like the cataract is returning because your vision is blurry again. Cell growth on the back of the capsule gradually clouds your vision.There is no way to know who may develop clouding of the lens capsule after cataract surgery. Up to 50 percent of cataract surgery patients experience this problem.Treatment for a secondary cataract is fairly simple. It involves a technique called YAG laser capsulotomy, in which a laser beam makes a small opening in the clouded capsule to allow light through. It is a painless outpatient procedure that usually takes less than five minutes. Afterward, you might stay in the doctor’s office for about an hour to make sure your eye pressure doesn’t increase. Generally, most patients immediately experience improved vision, while some experience gradual improvement over several days. Eye pain can take many forms, so it’s impossible to provide a proper diagnosis without a proper analysis of your symptoms. If you suffer from severe or constant eye pain, you should make an appointment with an optometrist to determine the cause. A discharge that forms a crust during the night that may prevent your eye or eyes from opening in the morning. If you suspect pink eye, make an appointment with your optometrist. Pink eye can be highly contagious for as long as two weeks after signs and symptoms begin. Early diagnosis and treatment can protect people around you from getting pink eye too. In addition, other serious eye conditions can cause redness. Seek urgent care if you also experience pain, light sensitivity or blurred vision. Dry Eyes – Sore eyes combined with a dry, gritty feeling could be caused by dry eye syndrome. 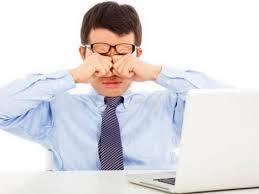 Constantly sore eyes may even water more, as the eyes respond to the dryness and irritation with excess tears. 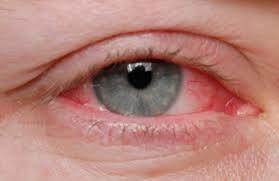 Allergies and eye infections can both cause your eyes to feel sore, red and itchy. Often itchy and irritated eyes can become sore after excessive rubbing. 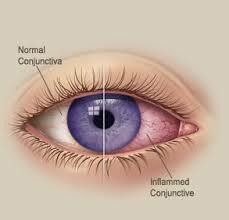 The eye infection – conjunctivitis is a particularly common cause of sore, red eyes. Contact lens irritation or contact lens solution irritation can also cause sore, red eyes. An injury to the eye or trauma can often cause sharp or stabbing eye pain. In extremely rare cases, sharp or stabbing eye pain can be a symptom of a much more serious condition, such as a brain tumor or aneurysm. However, a much more common cause is simply a headache or migraine that feels as if it is directly behind the eye. If you experience sudden eye pain combined with blurred vision, halo around lights, nausea or vomiting, it could be a symptom of acute closed angle glaucoma. This is a medical emergency, and you should seek immediate medical attention. If you experience a dull, aching eye pain, or a pain that feels deep within the eye, it may simply be caused by eye strain or overuse of your eyes. However, if the pain does not subside, it could be a symptom of a more serious condition or eye disease called glaucoma. Make an appointment with your optometrist for further investigation. Treatments for sore eyes obviously depend on the cause, and can be as simple as using eye drops or compresses for dry eyes and allergies, to medications and surgery for more serious eye conditions. If anything is stuck in your eye for more than a period of a couple of hours, you must immediately cease all attempts to remove it yourself. Keep in mind that the eyes are an extremely delicate organ and any attempts to try anything extra ordinary with them can only have negative and adverse results. If the foreign body you are talking about is not bothering you too much, then you are advised to visit an eye doctor to take care of it. If not you may need to call emergency services in your area. If there is a foreign body in your eye, such as a piece of grit, your eye doctor will try and remove it. She will put anesthetic eye drops in your eye first, in order to numb it and prevent any pain. 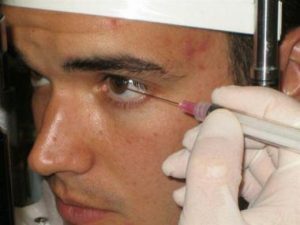 If the foreign body is easy to get to, it may be possible to remove it by simply rinsing your eye with water, or by wiping it away with a cotton wool bud or triangle of card. However, if this is unsuccessful, your optometrist may try and remove the foreign body by lifting it out with the tip of a small metal instrument. On average, nearly nine in 10 adults (88 percent) spend more than two hours each day using a digital device, with one in 10 people spending at least three-fourths of their waking hours on a digital device. This constant exposure to technology is a shock to our eyes with 65 percent of Canadians reporting symptoms of digital eye strain, such as dry, irritated, eyes, blurred vision, eye fatigue, neck and back pain and headaches. Digital eye strain is the physical discomfort felt after prolonged exposure to digital screen and is associated with the close to mid-range distance of digital screens, including desktop and laptop computers, tablets, e-readers and cell phones. It is not uncommon to start experiencing symptoms after spending two or more hours staring at a device, or more realistically, multiple devices. In fact, on average, 75 percent of people who use two or more devices simultaneously report experiencing symptoms of eye strain compared to only 53 percent of people who use just one device at a time. Tools are available to help technology users alleviate the discomfort of digital eye strain, minimize vision problems and prevent further eye discomfort. When used in tandem with practical “eye-gonomic” health tips, lenses tailored for digital screen use (computer eyewear) can reduce or even prevent digital eye strain. Dry eyes is a common condition that occurs when your tears aren’t able to provide adequate lubrication for your eyes. Tears can be inadequate for many reasons. For example, dry eyes may occur if you don’t produce enough tears or if you produce poor-quality tears. Dry eyes feel uncomfortable. If you have dry eyes, your eyes may sting or burn. You may experience dry eyes in certain situations, such as on an airplane, in an air-conditioned room, while riding a bike or after looking at a computer screen for a few hours. Treatments for dry eyes may make you more comfortable. These treatments can include lifestyle changes and eyedrops. You’ll likely need to take these measures indefinitely to control the symptoms of dry eyes. See your optometrist if you’ve had prolonged signs and symptoms of dry eyes, including red, irritated, tired or painful eyes. The Canadian Association of Optometrists recommends a yearly eye exam for adults – -not only to detect and to diagnose vision changes or problems — but also to maintain eye health. Regular vision examinations are also important for the prevention of vision problems created or aggravated by today’s academic and professional demands.